Citigroup's Panic/Euphoria model hit panic levels after a massive drop in stock prices last month, says Tobias Levkovich, the bank's chief U.S. equity strategist. This indicates "high probabilities of making money (with average 18% upward moves looking out 12 months)," Levkovich says. Stock-market investors entered panic mode after the wild ride to end 2018, meaning it might be a good time to buy equities, according to Tobias Levkovich, chief U.S. equity strategist at Citigroup. 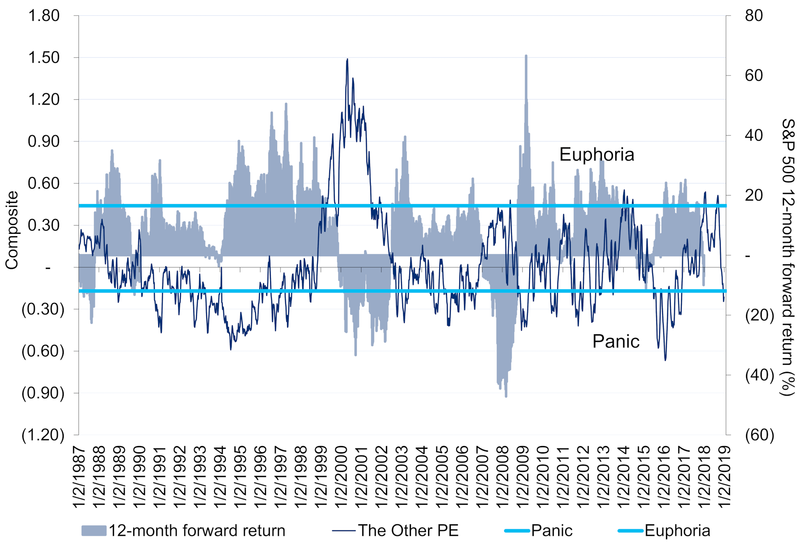 Citigroup's Panic/Euphoria model hit panic levels after a massive drop in stock prices last month, Levkovich said. This indicates "high probabilities of making money (with average 18% upward moves looking out 12 months)," Levkovich said in a note to clients on Monday. The model — which takes into account factors such as newsletter sentiment, margin debt and options activity — has had a good track record of predicting pullbacks and surges. It reached "euphoria" levels in 1999 before the dotcom bubble burst in 2000. It also broke into "panic" levels back in 2016 before the big post-election rally. The model also hit euphoria levels to end 2017. The S&P 500 posted its biggest one-year decline since 2008 last year, sliding 6.2 percent. The broad index also notched its worst monthly performance since February 2009 as well as its biggest December fall since 1931. Stocks fell as Wall Street weighed the possibility of a global economic slowdown, a potential monetary policy mistake from the Federal Reserve as well as ongoing trade talks between China and the U.S. This decline led Levkovich to trim his 2019 target on the S&P 500 to 2,850 from 3,100. "Ugly may be a kind word to describe the last month of stock market trading with a 'buyers' strike' being evident," Levkovich said. But "valuation is now indicative of 16%-like upside opportunity and sentiment has declined into panic," he added. "At this stage, we foresee opportunity with our key sentiment indicator implying a more than 97% chance of the S&P 500 being higher in 12 months."